Sentry in the cave is reading the comicbook of the sentry. We then get a flashback explaining why Wolvie joined the team. 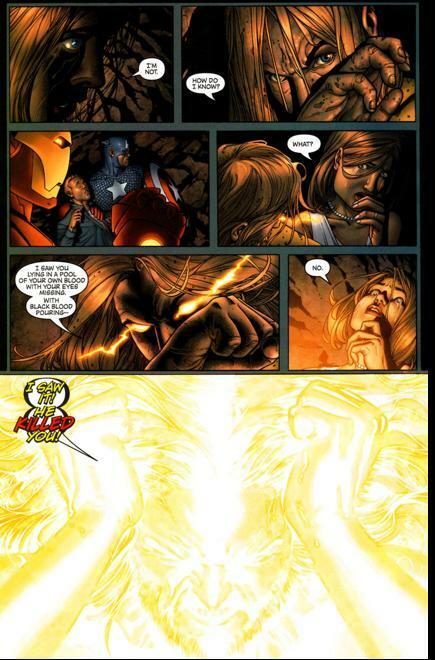 Unlike everyone else Stark is paying him just incase things go south an a hard decision needs to be made. Back in reality Jessica manages to subdue the wrecker through Talking to him before the team get rallied and they beat him to a pulp and shield arrives to carry him off. In the cave the sentry freaks out and teleports away. He ends up in his apartment back as a normal man. Stark alerts the team to rally at his coordinates. The team finds out Jessica has a new pheromone based power. Emma Frost appears on Sentry’s Television and prompts him to go outside, Once their he sees the astonishing x-men (joss team), the new avengers, namor and the inhumans. He starts freaking out saying this is what the void wanted and now he’s coming. The heroes are unaware as tendrils of darkness descend on them. That ¾ first pages done in retro style was done damn well, it has the simplicity of old comics and even that strange yellow tint (lol). It was a daring and truly impressive contrast to the rest of the comic which was actually done in “reality”. Art and colors always were great. I enjoyed the story, Sentry’s mystery is mounting and man it pulls you in, you want to know more and he is just spazy enough to drive that curiosity home. Story had a a good mix of action and story able to keep all kinds of readers engaged.